Piazza Walther is dominated … by the big statue of Walther von der Vogelweide. 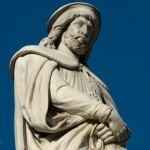 He was a wandering minstrel and celebrated Middle High German lyric poet from the Middle Ages who may or may not have been born in Bolzano. … It hasn’t always been that way, though. As I mentioned, until 1918, Bolzano was part of the Austro-Hungarian Empire, but was annexed by Italy after the war. In the 1920s, after Mussolini took over, he implemented repressive policies against the German-speaking population, aimed at increasing the Italian presence and culture in the region. Not surprisingly, Walther, a Tyrolean hero, didn’t really fit in with that plan, and Walther the statue was banished to a small park near the Talvera River. His plaza, where we’re standing right now, ultimately became a parking lot. However, by the 1960s, the parking lot was finally moved underground, and Walther triumphantly regained his rightful place in a peaceful and automobile-free square. 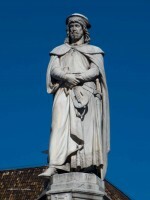 Today, Walther still gazes out over the visitors to his square, majestically rising above the fray, be the fray tourists, road races, or the occasional festival. — from the chapter “Welcome to Bolzano” in Life on a Gelato Diet. 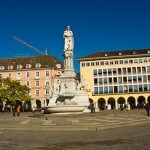 This entry was posted in Welcome to Bolzano and tagged Bolzano, Piazza Walther, Statue, Walther by leemcintyre. Bookmark the permalink.